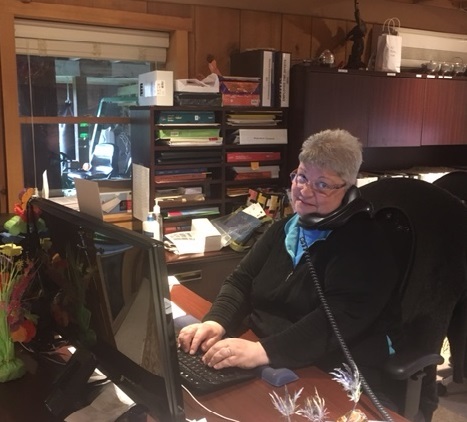 Our office administrator, Rose Strong, has been with Furia Rubel for four years. In observance of that anniversary, we sat down and asked her a few questions to find out how she keeps our office functioning smoothly, lessons she’s learned in the workplace, and – most importantly – what's top on her phone’s playlist. I am told that I’m the glue that holds it all together here. Not sure if that’s really it, but I’m the go-to-gal for most non-client questions such as, “Do we have any more yellow ink cartridges?” or “Did you know the half and half is sour?” or “Did the mail come?” Not only do I perform the office support role, but I also keep calendars, answer phones, proofread much of the content written in-house, share content on our social media, and write up our monthly newsletter content. I’m the one who keeps tabs on everyone else, which helps to feed my curious nature by knowing what’s going on all around me. What is the most annoying phone call you’ve received? Me: Good morning, Furia Rubel, this is Rose. Caller: Hi. Uhhhhh. I’m wondering if you can help me out with promoting my business. Me: Well, first, can I get your name? Caller: I’d rather not tell you that right now. Me: Okay. Can you tell me what the business is that you need help with? Caller: Ummmm, I’m not sure it’s the right time to tell you that. After about 15 minutes of trying to wrestle some basic information such as a phone number (Caller: I only have a throw-away phone) or email (Caller: I have a gmail address, but don’t use it much), the caller then proceeded to share with me a barrage of thoughts that had little to do with PR or marketing. What has been the most rewarding project you’ve worked on? We recently created a book for a client that works with an elderly population, to showcase the award-winning senior art programs the client runs. As a freelance reporter for a local weekly newspaper for the past dozen years, I was asked to interview some of the seniors who participated in the art projects, in order to get quotes and information for the book. The folks I interviewed were forthcoming with their thoughts, absolutely delightful to talk to, and enlightening. The project is still in the works, but I look forward to seeing it completed. Can you describe a challenge you’ve faced in the workplace and share what you’ve learned from it? I used to work at a large, national health insurance company, answering phones. The company trained their employees for three months on customer service procedures and their systems, the insurance industry, health care policy, insurance plans and even medical terminology. Then they put you on the phones and expected you to answer 80 to 100 calls per day. Mixing health care and money can be extremely volatile, and calls could be tremendously difficult on all of us. It was brutal some days, and morale was often low. After several years, I became good enough at the job to be what they called a senior customer service professional. I took the tough calls from my colleagues when things got out of hand and a caller asked for a supervisor. I also helped to train people. It was all that and the glamour, too! I’m a lover of the Christmas holidays and started sending out an email to my colleagues with a trivia question about holiday TV shows. People had fun seeing who could give the right answer first. The first year, it was just to create a little fun. The second year, I named my effort The 12 Days of Christmas Trivia and went to the dollar store, bought a dozen crazy prizes and went for it! The team loved it. It was the highlight of the days leading up to Christmas. I even threw in a few Hanukkah questions to give our non-Christmas celebrants the chance to win, as well. Every day, I would send out the question at a random time and wait for folks to answer. They were so excited to see what the prizes were. My email filled up fast. I handed out things like Vienna sausages, a tiny ratchet set, a dollar-store pregnancy test, plastic dog bowls, anything you can think of from a dollar store! It was a hoot, and to celebrate at the end, we had a food day. It takes so little, sometimes, to bring up morale in a workplace and make it fun. In this case, it wasn’t my job to do it – I wasn’t really a supervisor or manager or team lead – but just to get out of the rut we all felt we were in, it helped bring smiles and laughter and a sense of bonding between people all trying to do the same difficult job. What is something you’ve learned in the past week? A new way to manage client media clips to make my job more efficient. Is there something at your desk that represents you very well? My pencil sharpener. Not only do I like having sharp pencils, but I like keeping a sharp mind. Doesn’t always work, but I always make the effort. What are your favorite applications on your phone? Facebook, Instagram, Pinterest and shopping sites are by far my favorite time-users. However, I’m a news junkie and listen to NPR via the app, Tune-In Radio. And I enjoy the NYTimes and CNN apps. I was an art major in college, as was my wife, so we both enjoy spending our time doing most anything creative, from cooking and gardening to photography, writing, and making or viewing art. Making something can help refresh my spirit. I also enjoy spending time with my four-legged and feathered family of animals. What is the most played song on your phone/iPod? Probably the Indigo Girls’ Closer to Fine. Rose Strong is the glue that holds the office together, and protects me from all of the insidious cold calls we receive. I loved reading about Rose in the latest PR Lawyer blog. I can't help but laugh at the shared dialogue regarding the "most annoying call." I remember that day, Rose. Thanks for all you do and Happy 4th Anniversary with Furia Rubel.